Make fun cutout cookies with this rolled out sugar cookie recipe. Shapes cut out easily and are fun for kids and adults to decorate for Christmas or any holiday. 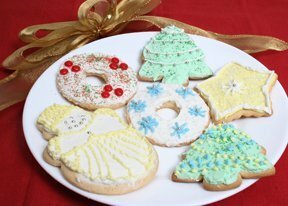 These decorated Christmas cookies are sure to get everyone's attention at your holiday gatherings. Have the kids help create their own unique little gingerbread boys and girls. They will enjoy showing them off during the holidays. Step-by-step instructions and many useful tips on how to make sweet and creamy fudge.